FC Augsburg: They couldn’t... could they? Kyle Barber asks if the Bavarian newbies can survive in the First Bundesliga. In the great pantheon of football annuls, FC Augsburg are veritable young upstarts. And, having found themselves gracing the Bundesliga for the first time this season, it is perhaps no surprise that they were immediately installed as favourites to return to the second tier. Yet their own history reflects experience way beyond their years, and may just engender the spirit and fight required to beat the drop. Amalgamated into their present guise as recently as 1969, it was only in 2006 that they secured a place back in the 2.Bundesliga, having dropped to the depths of the Bavarian Bayernliga (Germany’s localised fourth tier) at the turn of the 21st Century, with debts of some DM1.8m. Cue local businessman Walther Seinsch’s arrival as rescuer-in-chief, and his newly-acquired side’s emergence from the doldrums began. Since his investment, a far more meteoric ascendance has been enjoyed, with promotion finally secured just twelve months on from a heartbreaking 2-0 aggregate defeat to Nürnberg via the relegation play-off. As this year’s winterpause dawns – and following their 1-1 draw with Hamburg – Augsburg sit 17th in the top flight with 15 points, just two places (and three points) from overall safety, and one place (one point) adrift of Kaiserslautern in the play-off spot. To keep that in perspective, the average points required for overall safety over the past ten seasons has been 34, with a low of 31 in both 2002 and 2009. Since the introduction of the relegation play-off berth (in 2008-09), 32 points would have been sufficient to ensure a spot in that double-header. The highest tally required for safety in the last decade has been 37 points. Indeed, much like their potted history, Augsburg’s season has been defined by key moments, underpinned by a dogged resilience and never-say-die attitude. Such was no more evident than in the performance levelled in the 2-1 reversal to Bayern. Although finally succumbing to the Munich behemoth, die Fuggerstädter performance typified their approach, showing why it is that they have only shipped more than two goals on just four occasions. Augsburg have been relatively quick in ticking off those metaphorical checkmarks though, netting their first top-flight goal in the opening game with Freiburg after 53 minutes, securing their first point in the process. It did, however, take Jos Luhukay’s side nine games to get their first win (1-0 away to Mainz, courtesy of Jan-Inger Callsen-Bracker’s 88th minute penalty), picking up just four points prior to that. The Coach admitted to that marker coming as “a huge relief” to the team, but has ever conveyed a confidence and enthusiasm in his charges’ abilities. Since that victory, there has undoubtedly been a galvanising effect, with 11 points coming from their next nine games. At that rate, a total of 36-37 points would certainly seem to be within their compass. And with home ties against fellow relegation-battlers Kaiserslautern, Mainz and Nürnberg to come, their destiny is still very much in their own hands. Credit must also go beyond the basic man-management of Luhukay. Assuming the role of Coach in March 2009, the Mark Lawrenson look-a-like spent 15 months loyally utilising a 4-4-2 formation. But with promotion in hand, he was prompt in recognising the potential openness that his traditional line-up could yield in the top flight. Since matchday one, the adoption of a more resolute and compact 4-2-3-1 has engineered a greater resolve and rigidity. And while that has placed more pressure on the square shoulders of striker Sascha Mölders, it has gone a substantial way to realising the “unity and stability” called for by Luhukay at the start of the campaign. The main pitfall of the side, however, is their apparent inability to score themselves. With just 15 strikes in the ‘for’ column, only ‘Lautern have registered fewer. And to compound that issue, ten of those 15 have come through the forward-facing trio of Mölders, Hajime Hosogai, and Callsen-Bracker. They also have the second worst chances to games return (again behind Kaiserslautern). But, in being prepared to “win ugly as well”, the Bavarian’s have given themselves every chance of survival. Couple that with an apparent propensity to spring the odd surprise – consider their 1-0 triumph over a soaring ‘Gladbach – and the enthusiasm embedded in the squad, from Luhukay: “I’m very, very proud [of them]” through to experienced ‘keeper Simon Jentzsch: “We don’t play dream football [but] our team is a collective – the other most important factor in football” is proving to be far from misplaced. After 11 games of this season, the Official Bundesliga website ran a poll on who would be relegated. Augsburg received 44% of the vote. Yet if they can use the mid-season break to reenergise, and replenish the squad – a second striker is, you feel, a must – then Augsburg are in prime position to profit from the mistakes of those around them. Indeed, one of the greatest strengths bestowed on them comes in the guise of the paucity and inconsistency of the other teams around them; which allowed them to find their feet in the division without being cut adrift. While the moniker of being “the Napoli of Germany” – as bestowed on the team in 1974 – may still appear a long-way distant, somewhat closer at hand is Coach Luhukay’s pre-season aim “to be in the Bundesliga in 2012/13 as well”. And you never know, they just may do it. Over the Christmas period I will be importing this blog over to Wordpress.org. The URL www.bundesligalounge.com may be affected as a consequence, during the changeover. Once the change is complete, I'll update this blog with any details of feeds etc. Jon and I thank you for your support and wish you a peaceful season. The Bundesliga Show will be back in January. Its the last pod of the year and it is a huge one to finish off 2011...The Bundesliga Show and Bundesliga Blitz podcasts collide in London. Terry Duffelen and Jon Hartley from the Bundesliga Show are joined by Matt Hermann and Mark Hallam from the Bundesliga Blitz, and if that wasn't enough European football Journalist Andy Brassell is also joins the pod. Included in this bumper pod, a review of matchday 17 and a look back at a fantastic first half of the season in the Bundesliga. Alternatively you can download the podcast directly from here. OK, so this comparison is a little loose but stay with me. I watched Hertha Berlin versus Schalke thinking about how Teemu Pukki’s story seemed like it was out of Roy of the Rovers. This phrase ‘out of Roy of the Rovers’ is usually linked to anything that you think is pretty special, unusual...or just damn right spectacular. Because in Roy of the Rovers, nothing was out of bounds in terms of bending the rules of what should be possible. 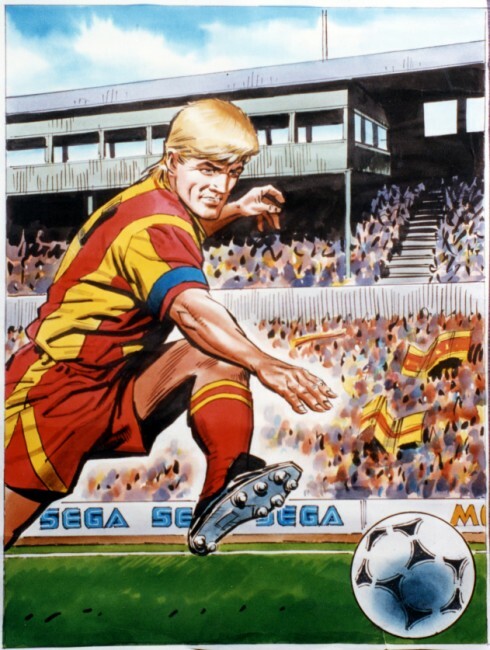 For those of you not familiar with Roy of the Rovers, here is a very brief overview. 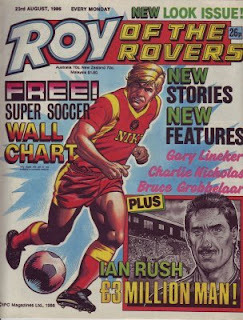 Roy of the Rovers was a very long running English football comic which mainly followed the fortunes of fictional striker Roy Race. Roy was a player for an awfully long time, and led his team Melchester Rovers to no less than 33 titles. As a fictional character Roy played unbelievably for around 40-years (partly as player manager), scored more goals than anyone else, won more titles than anyone else...he was something special, even if he was the work of someone's imagination. I was a big reader of Roy’s exploits as a child, in-fact it was about the only thing that I did like reading. 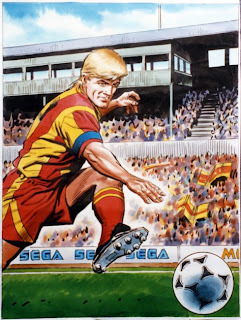 I have to thank this comic a little for my love of the football soap opera, because in Roy of the Rovers the story-lines got pretty unbelievable (sound familiar to modern football?). 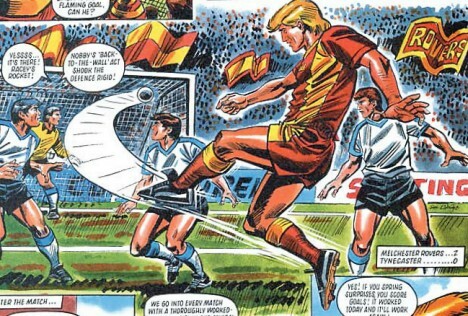 I’m sure that had it continued, Roy of the Rovers would have been telling tales of (alleged) corruption at FIFA, goal line technology and Russian oligarchs, way before they happened in real life. Needless to say, there were some pretty incredible things that happened at Melchester Rovers, but it didn’t always centre around Roy. At the tale end of the life of the comic, Roy’s boy Rocky had signed pro-terms and had been awarded his Dad’s number nine shirt. And this blond haired boy Rocky, somewhat reminded me of young Schalke striker Teemu Pukki. Rocky was not the finished article, but he played with that kind of youthful daring that is always delightful to watch, and that is what I like about Teemu Pukki. Pukki’s story has been told over and over again this season, about how he scored against Schalke three times in the Europa League qualifying round and then was swiftly snapped up by the Royal Blues, like in some kind of football fairytale. So befitting this fairytale, his start for his new club has been pretty good as well. Three goals in seven Bundesliga games is not bad, and at that rate he would be scoring almost 15 goals a season. Pukki has proved that he certainly has pace, great movement and a very good eye for goal. His goals so far have been a combination of running onto through balls and slotting the ball away, or doing like he did against Hertha, and blasting one in from range. The omens are certainly good for young Pukki because just look at the opportunity he has for the best type of schooling. At 21-years old he has the opportunity to work with one of the hottest strikers in European football at the moment in Klaas-Jan Huntelaar, and the man who really should take the crown of football’s real Roy of the Rovers...Raul Gonzalez Blanco. OK, so Raul couldn’t quite hit the heights of Roy with a mere 18 titles, but as the top goal scorer for Real Madrid and the all-time top scorer in the Champions League, it isn’t a bad shout. In fact I’d go as far as saying that if Raul bleached his hair, he would be a deadringer for Melchester’s favourite son. So if a little of Raul's magic rubs off on Pukki, then there is a chance that he could become a player with a big part in this young Schalke side that have a bright future ahead of them. With all this talk of football and comic book stories, it is right to point out that they do sometimes cross over. But thankfully for Schalke, unlike Melchester Rovers, there have been no earthquakes at the Veltins Arena, no shootings in the managers office and no members of Spandau Ballet in the starting line-up...but unfortunately for Schalke they also haven’t had the titles of Melchester Rovers either. I don’t think that it will happen in the playing time of Raul of the Rovers, but perhaps his legacy might help it to become a reality. With the penultimate matchday before the winter break out of the way, Terry Duffelen and Jon Hartley, review the action from week 16 in the Bundesliga. It was bad results for Dortmund and Borussia Mönchengladbach as they lost ground on Bayern...but congratulations to Augsburg who are now off the bottom. Also in the show, a look forward to Cologne v Mainz in midweek, the Europa League and the final matchday. This week on The Bundesliga Show Jon Hartley & Terry Duffelen review matchday 15 in the Bundesliga. They chat over the Borussia Battle between Mönchengladbach & Dortmund and the Bayern's big win over Bremen. Also The Bundesliga Show welcomes blogger on East German football, Dave Tunnicliffe, for an excellent chat about all things East. The Bundesliga Lounge. Powered by Blogger.